1) "Their Way of making Mustard in France, is to clean the Seed very well and to sift it; then they wash it in cold Water, leaving it one whole Night in the Water, and after that they take it out; and when they have squeez'd it with their Hands, they put it into a clean and neat Mortar, and having pounded it with a Pestle with some strong vinegar, they afterwards strain it. 2) Others take two Ounces of Mustard-feed, and half an Ounce of Cinnamon; which being pounded very small, they mix it with Honey and Vinegar and form a Paste of them, and of that make small Cakes, which are dried in the Sun or an Oven; when they use it, they dissolve a Cake in Vinegar, Verjuice, or other Liquor. 3) A third Way they have of making Mustard, which they call Anjou or Dijon Mustard: They first remove the Acrimony of it, by steeping the Grain in sweet Wine, during the Vintages, and preparing it as aforesaid ; then they put it into small Casks, which is the practise at Anjou; but the Dijonnese form it into small Cakes, and when they would use it, they dissolve it in Vinegar. This Mustard bears a better Price than the rest, because the Seed which grows at Dijon is better. 4) When they would make Mustard to last eight Days to mix it in Sauces or Victuals; they may take of the Seed and put it into a Pot of Sweetmeats, or other Pots with Wine well sweetned; it must not be used before the next Day; three or four Days after a little Wine may be mix'd with it the better to refresh it, and thus it will last eight Days." In consequence of this mark of princely condescension, the Dijonese municipality ordered the arms and motto to be beautifully sculptured over the principal gate of the city, which was done accordingly. But time… and that incessant drop of water which causes the destruction of the hardest stone obliterated the middle word me, the remaining ones, moult, tarde, gave occasion to the name in the following manner. For a long lapse of time, the merchants of Dijon have been, and are still, great dealers in …mustard seed and have a method of grinding it with salt, vinegar, and other ingredients, in order to preserve it, and send it to all parts of the world. 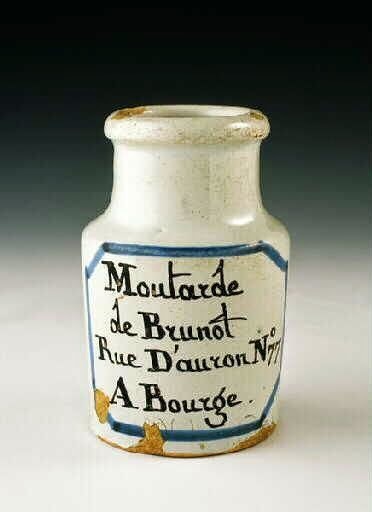 On their mustard-pots they used to paste a label, ensigned with the Duke of Burgundy's arms and the motto as it accidentally remained then over the gate of the city, moult-tarde; hence the name which the sinapi [mustard] composition has preserved to this day.